The P2317H is part of the Dell Professional series, which is a more accessible range of monitors sitting under the Ultrasharp in the overall hierarchy. If comprises a 1080p 23″ screen but with an AH-IPS panel it makes a good choice for anyone wanting an entry level monitor with the top image quality you can expect from Dell. This size is a little smaller than my own personal preference but if you like smaller screens or simply don’t have the space then there’s no reason not to have a good close look at this model. The P2317H is the replacement to the older P2314H. It’s hard to see what’s changed as both models have similar specifications listed. P2317H vs P2314H, going though the spec sheet it looks like the P2317H now comes with an HDMI port which is handy, but both have DisplayPort so it’s not like it wouldn’t work with a modern graphics card. Perhaps more interesting is the drop in quoted response time from 8ms to 6ms. The P2317H fixes a critiscm of the previous model, it now comes with an HDMI port. There’s also DisplayPort and for the old school PC owners, there’s even VGA included too. The build is up to Dell’s normal solid standards, there’s nothing too spectacular here – the frame is narrow enough but not as minimal as the more premium models. The stand is fully functional offering all the adjustments needed, it doesn’t look too bad either. VESA 100 mounting is also avaiable for those, like me, that like to fix your monitor to an arm. The IPS based panel is designed to give great colour accuracy and range, Dell quote this model has have a colour gamut of 82% (CIE 1976) and 72% (CIE 1931) with a colour depth of 16.7 million colors. This panel technology also provides more stable viewing angles so if you’ve ever been annoyed by deteriorating images when viewed from obscure angles you shouldn’t suffer so much with this. A further enhancement over the previous model is an improvement in the response times. Dell now quote this as 6ms. Whilst this is not the 1ms you see on super fast TN gaming platforms it is well within the tolerance for gaming and won’t hold you back from enjoying a blast on the latest incarnation of Doom. Low lag and low blur means this is a good all round mainstream monitor. We give the Dell P2317H a 4.5 out of 5 rating. Want to know what existing owners of the monitor think? You can read real user reviews here. Should I buy the Dell P2317H? This professional series Dell gives great images thanks to the IPS screen. 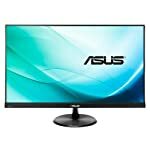 If you are willing to spend more for the best then take a look at the Ultrasharp range but this is a good mixed use monitor priced for the mainstream. If you are having some doubts about this purchase then why not read some real owner reviews and see what other buyers think. Welcome to the Dell P2317H FAQ. This section attempts to answer common questions you may have, please get in touch if you have any more queries or if you think our answers need updating. Does this screen pivot from landscape to portrait? Yes, you can rotate it round 90 degrees. And back again. You can also mount it on a monitor arm if you wish as it comes with VESA 100 x 100 fittings.